Bearden senior post Kordell Kah (24) reaches for a loose ball with Hardin Valley Academy senior guard Cartez Campbell. The Bulldogs won going away 73-50 Friday, Nov. 30, at BHS. 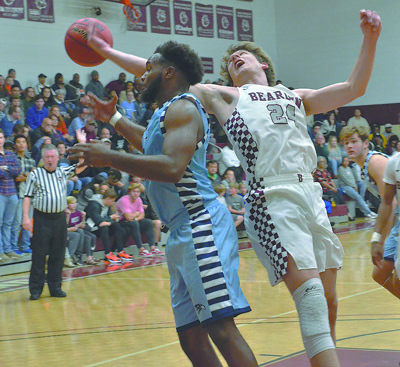 KNOXVILLE -— For the first half of its District 4-AAA basketball game against Hardin Valley Academy, Bearden High School’s boys were locked in a dogfight. But eventually the Bulldogs would pull away and capture a 73-50 victory over the Hawks Friday night, Nov. 30, before a packed and boisterous house at BHS. “It’s great to have Roman (Robinson) back (from injury) and we were able to go out and get another win without Drew (Pember, 6-foot-10 senior wing) and Shaq (Brown, 6-foot-5 senior post),” both out with injuries, Glover said. He also ran Bearden’s offense and provided a huge lift as the Bulldogs’ full-court press rattled and all but stifled the Hawks (3-4, 0-3) after halftime. “Their press killed us,” HVA senior guard Cartez Campbell said. The Bulldogs (6-2 overall, 3-0 in District 4-AAA) got 15 points from Trent Stephney. Robinson scored 11 and Kordell Kah added 10. “We’re pretty beat up right now,” BHS head coach Jeremy Parrott said. “But Roman was in his second game (back) and he’s always been a ‘Steady Eddie,’ and he did a good job for us tonight,” he added. Jack Niezgoda, a junior, led HVA with 13 points while senior Bryce Jenkins and junior Allan Sumner scored 11 apiece. Campbell finished with six points.